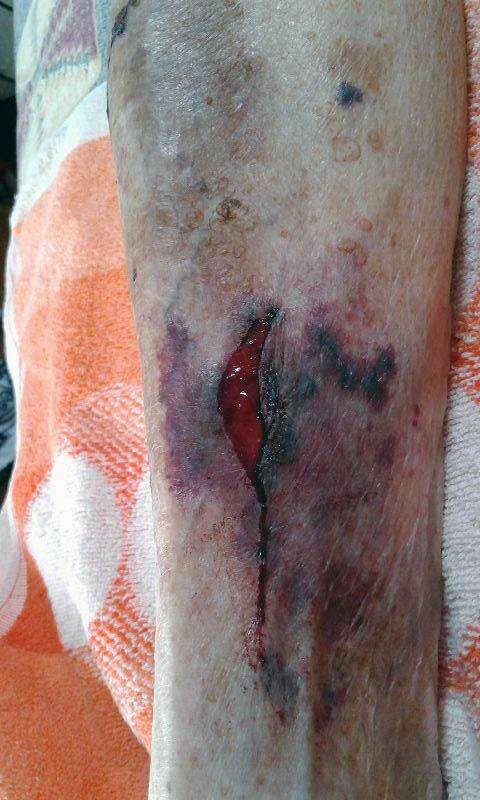 Thin skin is an underlying cause of many skin tear injuries particularly in the elderly. 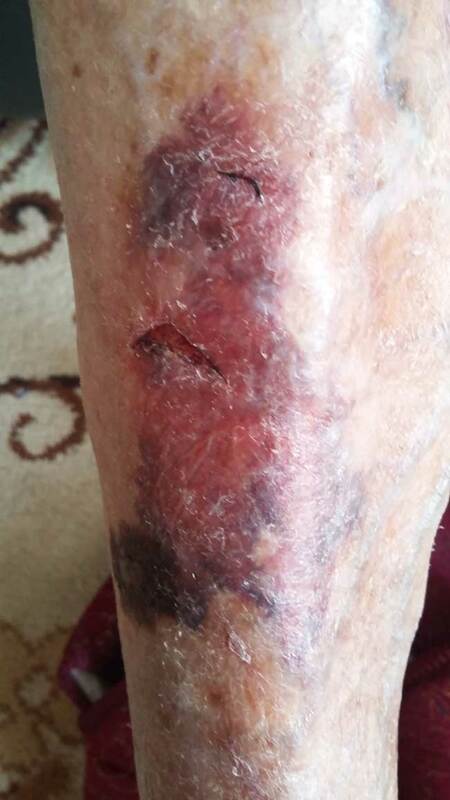 This case study reports on the ongoing skin tear treatment of recurrent bruising and skin tear injuries on the legs of an 89 year old female who lives alone and is subject to occasional injury. Subject presented with fragile thinning skin which was highly susceptible to extensive bruising and skin tear injury. A seven month old damaged area was present on the shin. 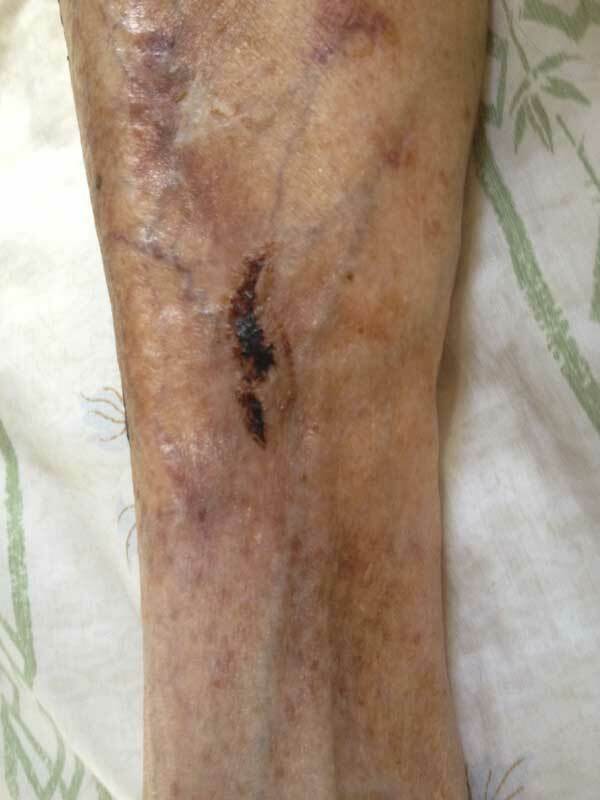 Her condition was further complicated by poor capillary integrity and blood leakage into the surrounding tissues after any skin injury or impact. This chronic leakage was causing ongoing degradation of underlying structures in the tissues and compromised the healing process for many months. Historically these fluids would rise then turn black and hard on contact with the underside of the skin and ultimately displace large areas of full thickness skin leaving open wounds similar to a category 3 skin tear when they fell off. 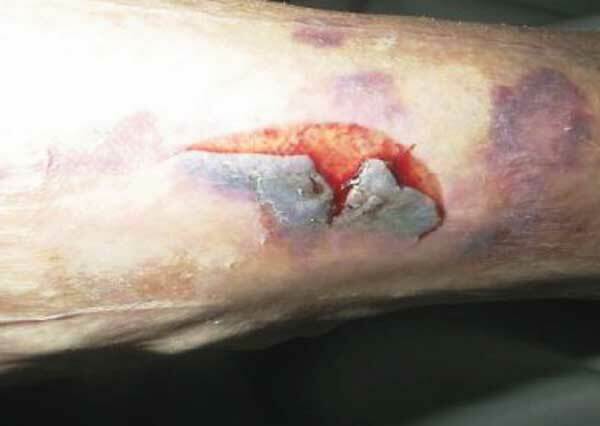 Some of these skin displacements (sloughing) would occur months after the original injury. Long term use of blood thinning medications are likely to be a contributing factor in this subjects poor skin condition. 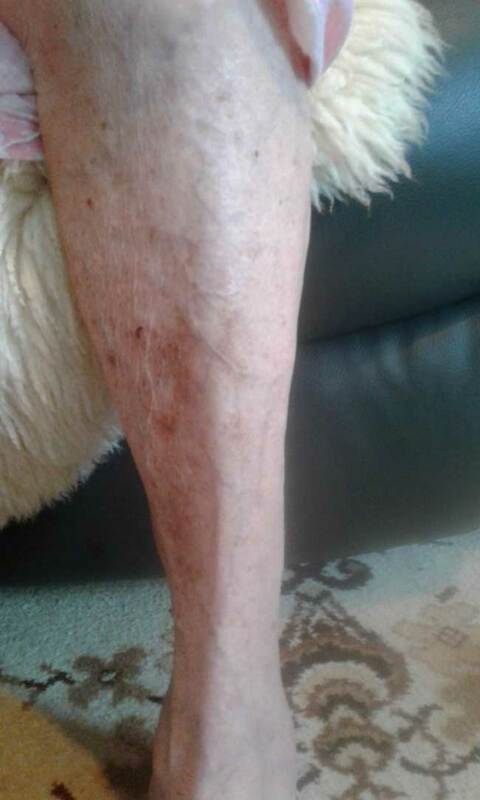 Shows slow healing skin tear injury on right leg resulting from a firm, but not overly hard, knock which occurred five months prior to the photo being taken and two months prior to the commencement of the DHAA Vitamin C Serum skin treatment cycle. Months of chronic leakage from damaged capillaries is the most likely cause impeding proper healing. If you are on a big screen zoom in to see the poor quality gossamer thin skin that has tried to form over the wound. Photo One: Subjects typical response to skin tear incident. Photo taken 5 months after original injury. After trying several treatments unsuccessfully it was decided to treat both legs from the knees to the toes with a Dehydroascorbic Acid (DHAA) and Vitamin C Skin Serum in vegetable glycerine. The skin issues resolved without incident over the next eight weeks and the legs were looking very good until two separate skin tears occurred. 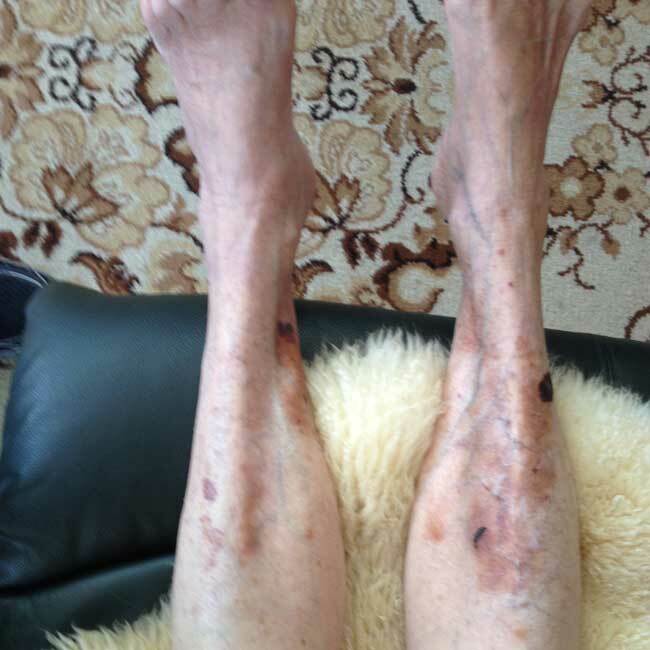 Photo Below - Both legs after six weeks of daily administration of the serum to all skin areas below the knees including the feet. 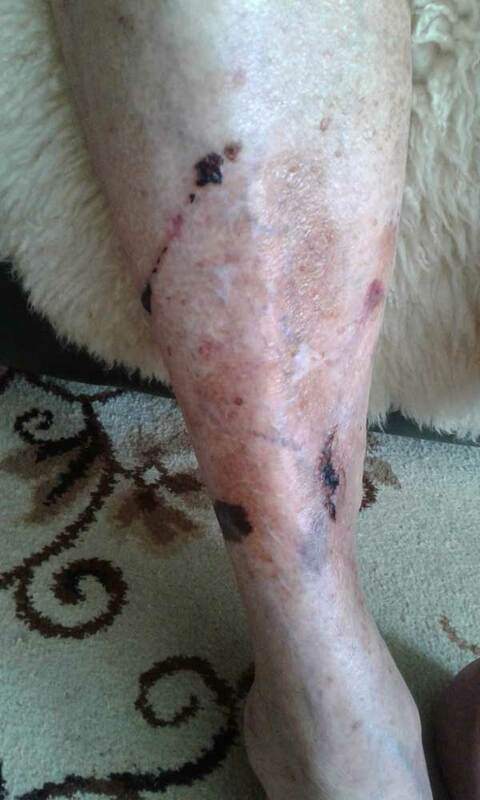 Photo Below - Right leg after eight weeks of daily treatment with Dehydroascorbic Acid (DHAA) and Vitamin C Skin Serum. 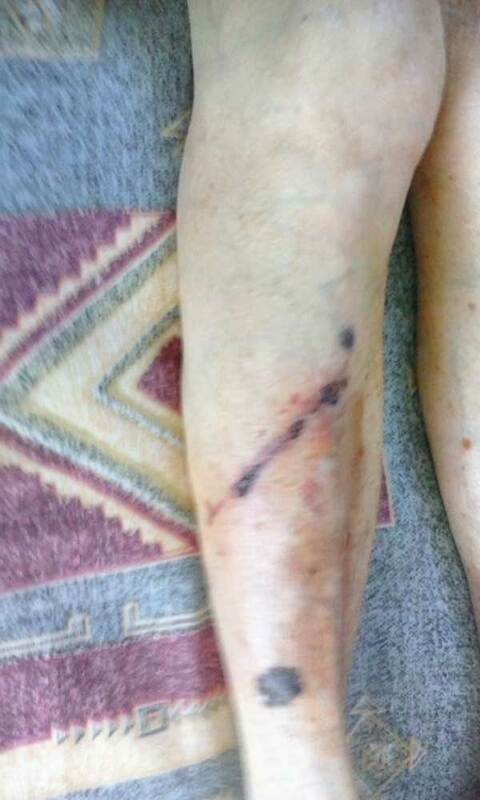 Both legs were vastly improved, the skin appeared healthier, thicker and more resilient. 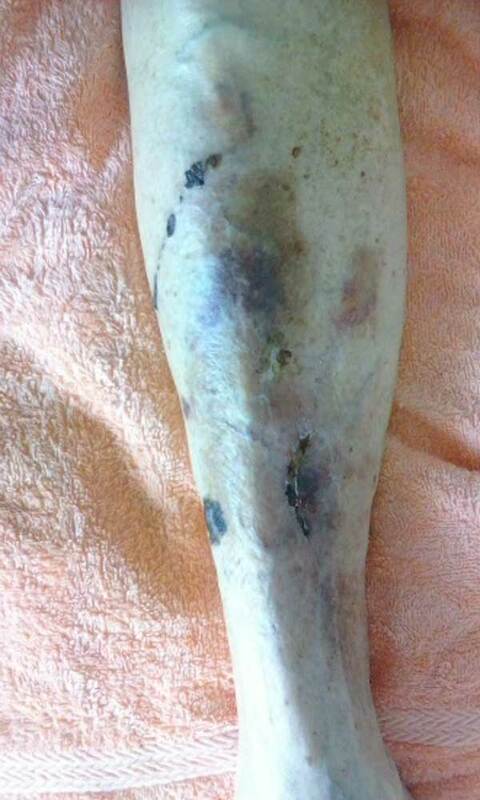 Photo Below - Left leg after eight weeks of daily treatment with Dehydroascorbic Acid (DHAA) and Vitamin C Skin Serum. 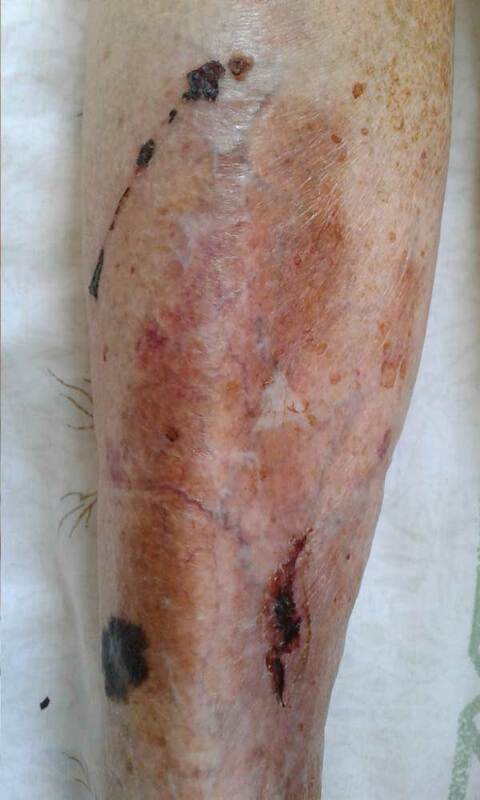 Two weeks later a graze type accident occurred resulting in a longitudinal thin skin tear with moderate bruising with small portions of skin missing. 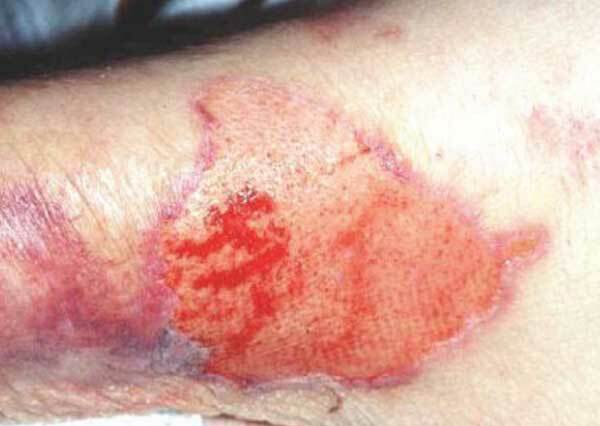 Initially family members feared that this would spread into the bruising, tissue contamination from leaking capillaries and skin loss seen in photo one. However, this time was different, the pre-injury treatment of the affected area with Dehydroascorbic Acid (DHAA) and Vitamin C Skin Serum for 11 weeks had obviously improved something fundamental in the skin and underlying tissue. Photo Below - 16th December 2016 Right leg. One week after first post treatment skin tear incident. Note speedy resolution of bruising and absence of capillary leakage. Photo Below - 21st December 2016 Right leg. 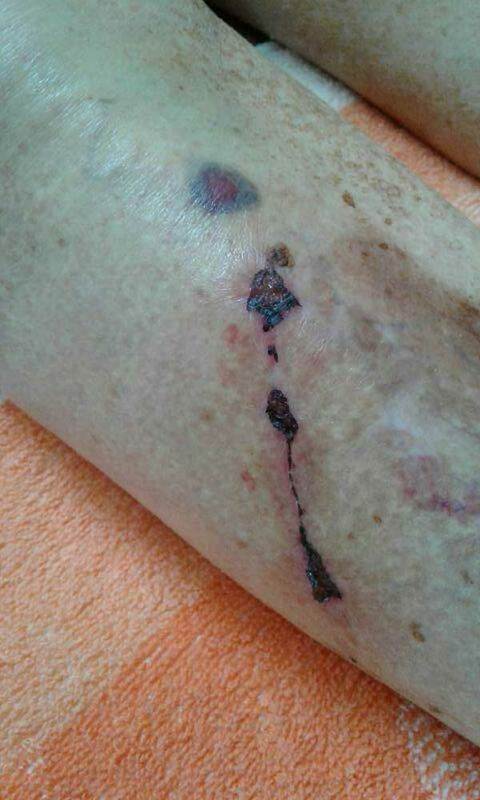 Three weeks after skin tear incident one and the effects of the DHAA Vitamin C serum are obvious, accelerated bruise resolution and clean healing with no ongoing breakthrough of bruises. Healing response normal. Capillaries normal. The next week 29th December 2016 a more serious fall resulted in a deep category 2b* full thickness skin tear. The Dehydroascorbic Acid (DHAA) and Vitamin C Skin Serum had been in daily use for 12 weeks prior to this latest accident. Photo Below - 29th December 2016. Right leg at time of injury. The darker, more widespread bruising and greater depth of tear is consistent with a greater applied force than skin tear incident one. A jammed back door operning quickly inwards and striking the shin is the suspected culprit. The new skin tear required medical treatment so a wound dressing nurse was brought in. The wound was dressed and changed regularly over a nine day period. 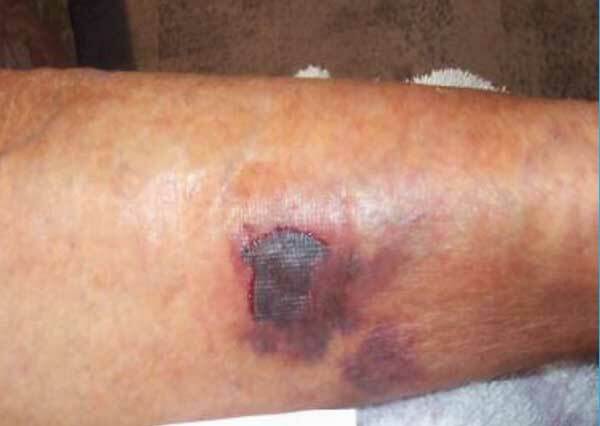 Extensive fresh bruising is evident below and beside the site of the skin tear, bruising above the skin tear is mostly residual from skin tear one. Note: DHAA Vitamin C serum was applied over both legs only three times during the 8 day interval the wound was bandaged. Photo Below - 6th January 2017 Right leg. Detached skin tear flap appears to be re-attached with no evidence of capillary leakage and strong indicators the flap has good blood supply. Bruising resolving normally. The daily DHAA Vitamin C Serum treatment was reinstated and the area was left open. Photo Below - 12th January 2017 Right leg at 13 days after skin tear two. The bruises continue to improve and are behaving much more like normal skin as opposed to the first photo on the top of this page. No evidence of weak capillary or internal fluid leakage problems. Bandages off for five days and medical stocking used as wound protector. Torn skin flap now well attached with good blood supply evident, damaged and bruised section of detached part of flap well healed with good colour and excellent bruise reduction. Photo Below - Right leg 16th January 2017. At 28 days after skin tear one bruising almost resolved. Remaining crusts partially detached, new skin well formed underneath. Photo Below - 16th January 2017 - Whole right leg at 28 days after skin tear one and 17 days after skin tear two. Healing and bruising well under control and nothing of any concern evident. The whitish areas are new skin pushing the gossamer thin layers off. Photo Below - 19th January 2017 - All bruising from injury one has completely resolved. The orange sheen on injury two is from the DHAA Vitamin C Serum which has not been thoroughly washed off due to possible skin fragility over the bruised areas. 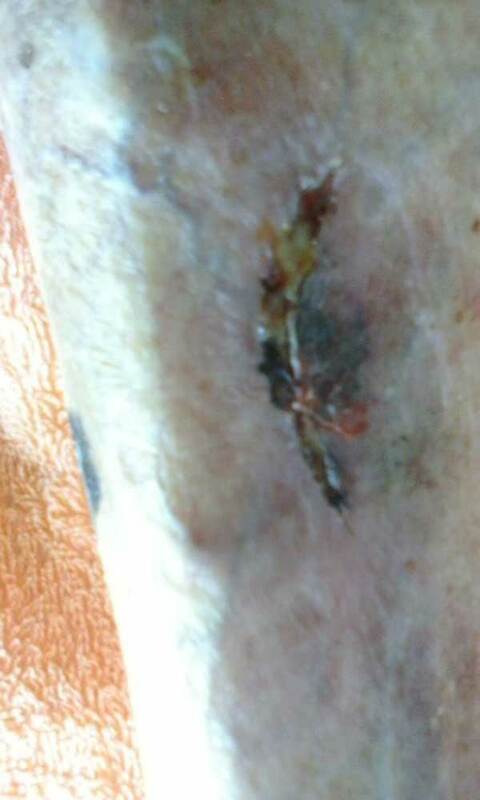 Skin tear flap attached and sealed by scab. Some darker bruising still evident around and below tear on right. Other shin bruising fading. Photo Below - 22nd January 2017 - Day 23 and healing at a fast rate continues with deeper bruise below skin tear nearly resolved. All other bruises resolving nicely. It was a fortunate coincidence in having an area of susceptible thin skin which had been pre-treated for eight weeks with high dose DHAA and Vitamin C Serum prior to the two skin tear injuries. 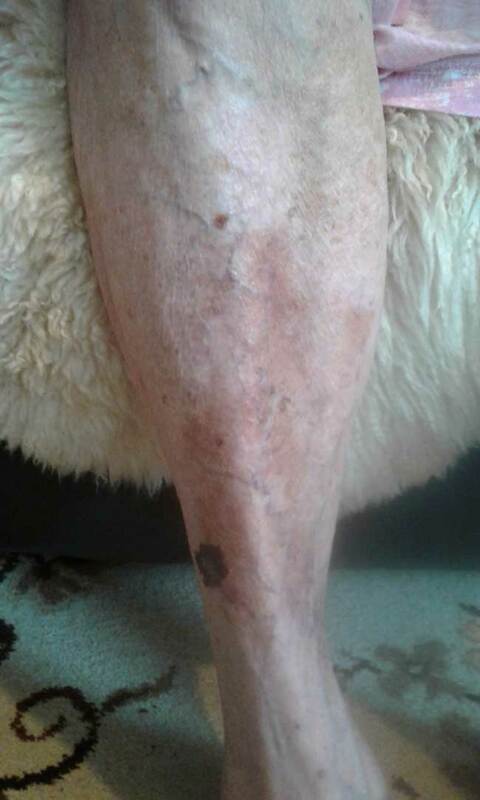 As a result we have found DHAA skin formula appears to be an excellent preventative treatment for thin fragile skin and deep bruising severity in the skin of this elderly subject. The serum appears equally effective on light tears with sharper instruments and less impact weight, (skin tear one), compared to heavier blunt force injuries with deeper bruises, (skin tear two). The fact that the two new injuries occurred on tissue that had just recovered from seven months of healing an area of chronically leaking contusion makes these result even more compelling! It appears the DHAA Vitamin C Serum improves skin thickness, collagen, capillaries and general blood vessel strength giving increased resilience against future excessive bruising responses. After a DHAA Vitamin C Serum treatment regime has been well established (8 weeks or more) the treated area has shown to be capable of reducing future skin tear injury severity and associated complications that usually occur. It is also appears to be an effective treatment that will accelerate healing of skin tear and bruising when applied after the injury. Skin tear two shows a similar a force of, but posssibly smaller contusion injury to the stubborn original injury in the very top photo. Skin tear two has a more serious skin tear injury. While not exactly the same injury some comparisons can be made. The differences in internal fluid leakage associated with thin skin bruising of these two injuries are likely to be the most important factor to wound healing times. Original Injury: Five months after the incident the subject presented with, (top photo in article), some leakage was still evident and healing was incomplete, torn skin not healed. Skin tear two: At seven days the bruising had not spread beyond it's original extent, some bruising extent had lessened near the edges, capillary leakage absent. Three weeks after injury bruising faded and capillary leakage still absent. Scab formed normal healing well underway. 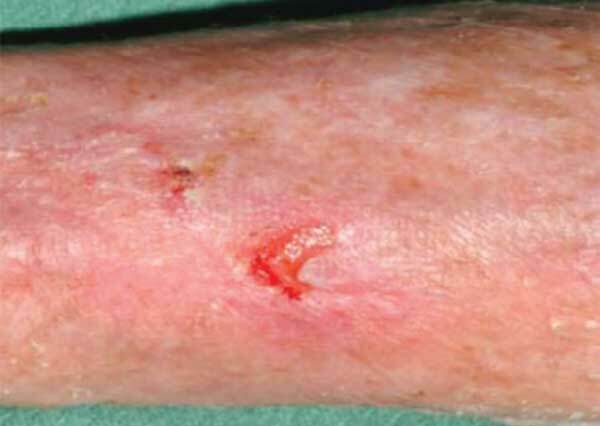 Injury to the skin eight weeks after the commencement of the DHAA Vitamin C treatment apperars to result in far less severe bruising and capillary damage than previously observed in similar injuries prior to DHAA Vitamin C treatment. It also appears the new skin tears on pre-treated tissue heal more quickly with significantly less capillary leakage. The reduced final extent of bruising and apparent complete resolution of the post bruise skin sloughing and capillary leakage issue is remarkable. 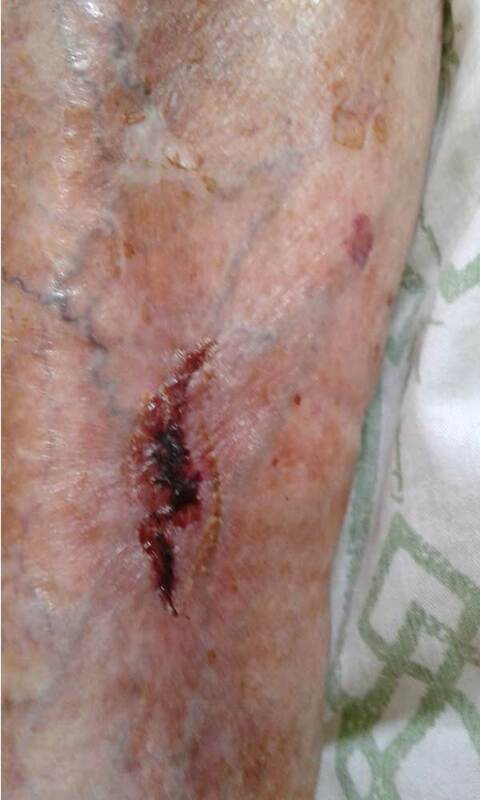 The improved wound healing times and the speed with which capillary leakage and bruising are resolved after injury indicates strongly that collagen and elastin production in the skin and associated capillaries and tissues has improved from very poor to close to, or above, healthy levels for an 89 year old due to the action of the DHAA Vitamin C Glycerine Serum. The skin also appears to have thickened considerably. The absence of any infections or even a hint of edge redness despite the application of the serum over broken skin areas for such an extended period possibly indicates a strong anti-bacterial action. This postulation is likely correct as this same patient has previously been successfully treated with Dehydroascorbic Acid (DHAA) and Vitamin C Skin Serum for antibiotic resistant bacterial infection of a toenail and a concurrent toenail fungus in both feet. DHAA is also reported to increase glutathione production and this could further explain the accelerated healing, collagen production and immune system stimulation. Vitamin C Dehydroascorbic Acid Serum could be used as a preventative measure to minimise the risk of future thin skin tear or bruising complications in vulnerable individuals by daily application of the serum to thin skin. If the DHAA serum is applied daily to thin easily bruised skin and/or areas with weak or leaking capillaries and/or areas at risk of skin tears for any reason it will most likely improve or normalise future injury extent and healing times. The issue of post injury complications caused by capillary leakage may also be diminished considerably or normalised. Rebuilding capillary integrity, collagen and elastin beneath the skin is not a rapid process. Daily DHAA Vitamin C serum treatment takes four to six weeks to make noticeable changes in the tissues below the skin, at twelve weeks the change is usually very obvious. Feel free to contact us to inquire about DHAA Vitamin C serum if you are having similar issues with thin, fragile easily bruised, and easily torn skin or purchase directly here . This article will be updated as further news becomes available. When thin fragile skin is torn it is important to assess the extent of the injury. The Skin Tear Audit Research (STAR) Classification System has been developed for this purpose. This system comprises three main categories and two sub-categories of skin tears as outlined below. Full skin tear management info here It's worth reading! 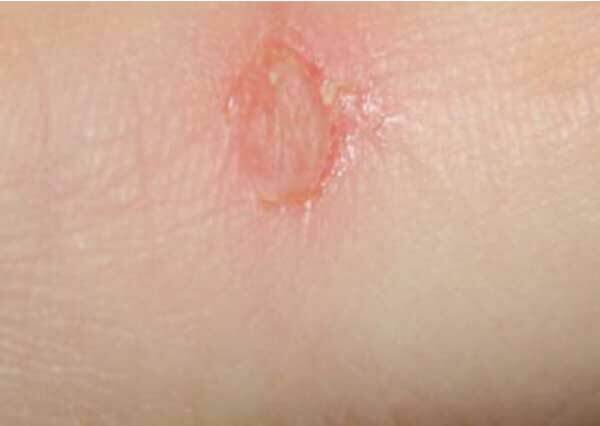 Photo Above - Category 1a Skin tear. The edges can be realigned without undue stretching. The skin or flap colour is not pale, dusky or darkened. Photo Above - Category 1b Skin tear. The edges can be realigned to the normal position without undue stretching. The skin or flap colour is pale, dusky or darkened. Photo Above - Category 2a Skin tear. The edges cannot be realigned without undue stretching. Skin or flap colour is not pale, dusky or darkened. 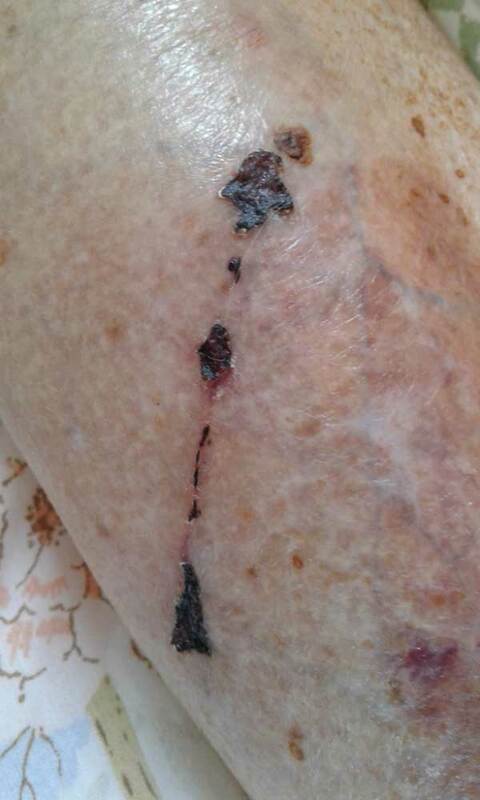 Photo Above - Category 2b Skin tear. The edges cannot be realigned to the normal position without undue stretching and the skin or flap colour is pale, dusky or darkened. Photo Above - Category 3 Skin tear. The skin flap is completely absent. Both Category 2 and Category 3 skin tears result in incomplete skin coverage even when aligned and dressed correctly. To reduce the risk of infection always cleanse the skin tear following assessment using sterile saline or water at body temperature to remove debris and any residual blood. For serious skin tears seek medical advice as sterile cleaning and specialist non stick pressure bandages and techniquies will minimise the risk of infection, enhance the chances of reattachment of torn skin and improve healing times.